It's 04:02 in Pahrump, USA right now. 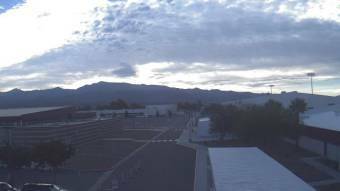 Pahrump Valley High School A webcam in Pahrump, Nevada - camera location: Pahrump Valley High School. Mount Charleston, Nevada: Mt. Charleston Lodge, 19.3 miles away. Mountain Springs, Nevada: Mountain Springs Saloon, 29.5 miles away. Amargosa Valley, Nevada: Amargosa Valley Weathercam, 38 miles away. Las Vegas, Nevada: Las Vegas Day School, 45.6 miles away. Las Vegas, Nevada: Las Vegas Springs Preserve, 45.6 miles away. Las Vegas, Nevada: Red Rock Visitor Center, 45.6 miles away. Las Vegas, Nevada: Sierra Vista High School, 45.6 miles away. Las Vegas, Nevada: Wetlands Park (Clark County Parks & Recreation), 45.6 miles away.